It's not unusual to use USB to carry digitized audio. After all, even USB 1.1 has the bandwidth. You may have USB speakers or you may stream audio from a hard drive that's connected to your computer through a USB cable. Can you hear the distortion that the USB link adds to your music? Some people think they can. This über-expensive USB cable is simply revelatory in its combination of ease and refinement on one hand, and resolution and transparency on the other. 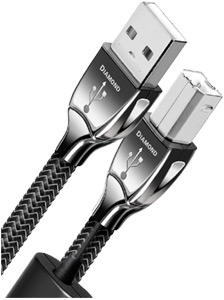 Although capable of resolving the finest detail, Diamond USB has a relaxed quality that fosters deep musical involvement. Would you pay $695 for a USB cable? Deep musical involvement? We're talking a digital cable here. Audiophiles, please get your ears out of the sand and listen to me. USB is a digital bus. As long as the receiver can properly receive the bits and tell the difference between a logic 1 and a logic 0, the digital representation of the audio at the receiver's output will be a perfect replica of that which was transmitted. You claim that you can hear the difference between an inexpensive and expensive USB cable? I'm sorry, but you have been deceived. On average, digital links deliver one bit error for every 1012 bits sent. You can't possibly hear that. Next, you'll tell me that you can hear the difference in clock jitter produced by that inexpensive cable. Again, as long as the bits are properly interpreted, there is no difference in signal as a result of a cable. If there is any distortion in the entire audio chain, it's on the analog side. Any time you convert a digital representation of audio into an analog signal, there is some distortion added. I refuse to believe that anyone can hear that distortion in any good audio system. A top notch audio analyzer might detect a difference, but not your ears. Now, I can understand not buying the cheapest of USB cables, but I'd do that for reliability, not audio quality. Don't fool yourself. Paying $695 for a USB cable will not get you better audio. You will get the same audio quality from a $6.95 cable. The audio quality is a function of the original encoding, the decoding, the analog signal processing and amplifier, and the speaker. Go ahead, prove me wrong. Get yourself a top-of-the-line audio analyzer and show me the difference in audio quality between cables that carry digital signals.